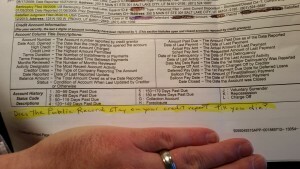 How long does a public record (judgment or bankruptcy) stay on my credit report? 7 years for judgments. 10 years for bankruptcy. Unpaid tax liens report forever. 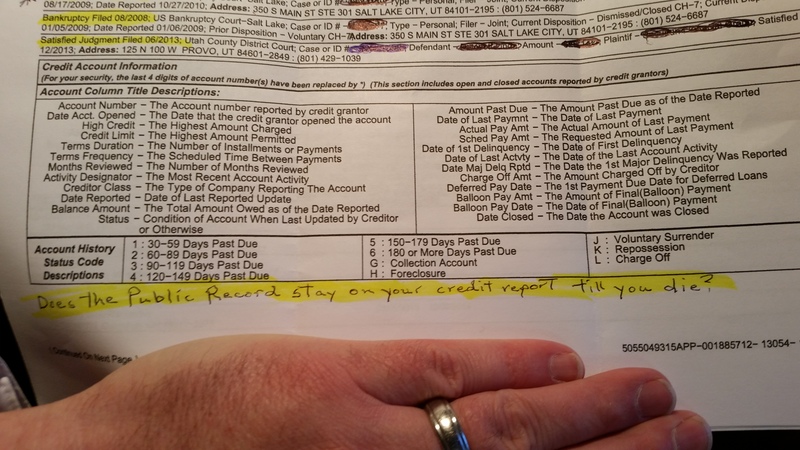 I had a client send me the attached copy of her credit report with the hand-written question at the bottom, “Does the Public Record stay on your credit report til you die?” I responded to her directly via text (yes, I text my clients and respond to texts). However, I thought it’d be nice to lay it out in a table I found at myfico.com. Chapter 7, 11 and 12 bankruptcies remain for 10 years from the date filed. Completed Chapter 13 bankruptcies remain for 7 years from the date paid, and 10 years if not completed. All judgments remain for 7 years from the date filed. Inquiries remain for 2 years. Satisfied judgments remain 5 years from the date filed. Paid collections remain 5 years from the date of last activity. Now this doesn’t mean that the judgment is enforceable if you listed it in your bankruptcy and received a discharge. However, they can still report it, and it may still be attached to any real property you own. This entry was posted in Utah Bankruptcy on March 13, 2015 by robertspaynelaw. What happens if I miss my bankruptcy court hearing? Your case will probably be dismissed, but it all depends on what kind of hearing it was and why you missed it. If you have a strong reason, you should be okay, but you should really call your attorney beforehand to explain exactly what is going on. This is your one real court appearance for most cases. You will receive a letter from the court and a reminder from your attorney to attend this hearing. If you miss it, the bankruptcy trustee will file a motion to dismiss. There is not an automatic dismissal, but if you don’t respond and object in 20 days, your case will be dismissed. If you had a really good reason for missing the 341 Meeting, like an emergency room visit or being kidnapped by pirates, then you can object and move that the court reschedule your 341 Meeting. Normally, there is no problem in rescheduling the meeting. If you have a weak reason, like forgetting the meeting, then there is a 50/50 chance that the court will allow you reschedule the meeting, otherwise, your case will be dismissed, and you will have to file a new case. Most of the time, you don’t need to go to your confirmation hearing in a chapter 13 case. Your attorney will appear for you. Missing this hearing is not going to hurt your case unless your attorney directed you to attend. In this situation, if you fail to attend and the case is dismissed, you’ll have to file a new case, (unless you have an amazing reason like above). If you’re going to this kind of hearing, then there is already some kind of awful thing going on in your case. Do not miss this exam, or worse things could happen than a simple dismissal. This entry was posted in Utah Bankruptcy on March 12, 2015 by robertspaynelaw. 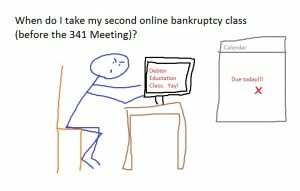 When do I take my second online bankruptcy class (before the 341 Meeting)? You do NOT have to take it before your 341 Meeting. In fact, you may want to wait to take it until near the end of your case. Just remember that you do have to take it to get a discharge of your debts in your bankruptcy case. Under the 2005 BAPCPA amendments to the U.S. bankruptcy laws, you are now required to take a pre-bankruptcy class (the Credit Counseling class) and a post-bankruptcy class (the Personal Financial Management or Debtor Education class). 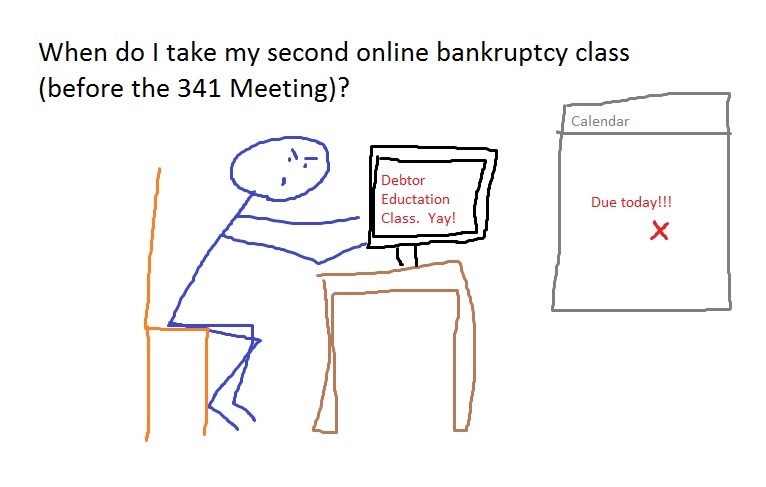 I generally have my clients use www.debtorcc.org. Not because they’re better than the other courses, but because they’re cheap (currently $9.95 for a married couple). In a chapter 7, you should take the class about 2-3 months after you file. In a chapter 13, you can wait until 3-5 YEARS after you filed the case. There is no reason to jump the gun and pay for the class today. You may decide to let the case dismiss or close without discharge for many complicated reasons. It is not worth taking the class early, and there may be good legal reasons to not take it yet. This entry was posted in Utah Bankruptcy on March 11, 2015 by robertspaynelaw. Can bankruptcy affect my ability to get a new apartment? Yes, and sometimes it’s pretty awful. When you apply for a new apartment lease, they will generally run a credit check, and your bankruptcy may disqualify you from getting an apartment at some complexes. This doesn’t make sense, since you now have no debt and cannot include a new lease in your old bankruptcy, but I am running into it in at least 1 in 5 cases I file. I don’t know a good way around it except to go to another apartment complex and try again. Sometimes, the potential landlord will accept a letter from me advising that we cannot list this new lease in the old bk case, but it doesn’t always work. There is no bankruptcy law that protects you from this, and I cannot force a new landlord to take you as a tenant. It doesn’t always happen, but if you do get rejected for a new lease, you will need to go somewhere else. This entry was posted in Utah Bankruptcy on March 10, 2015 by robertspaynelaw. I am inheriting a car, but it’s not in my name yet. Do I have to tell the bankruptcy trustee, and how will he find out? Yes, you have to tell the trustee. No, he may never find out if you don’t. But if you don’t disclose this, you’re committing fraud and perjury on your federal court documents. 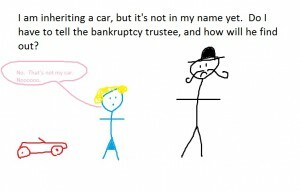 I had a client today who disclosed that she will be inheriting a car worth about $5,000. She has the title but it hasn’t been signed over to her yet. She asked what would happen if she didn’t sign over the title to her name until a month after we filed. Honestly, the trustee would probably never find out, and she’d get off Scott free. But, if he did find out because of an angry creditors, ex-husband, cranky neighbor, jealous siblings, or even his intuition in running a tlr (vehicle title search), then he would discover the vehicle, and she would unleash a hellstorm of legal proceedings, on herself. She would lose the car, her bankruptcy discharge would be revoked, and she might even face criminal charges. I advised her to get the title in her name, sell it, and spend the proceeds on exempt items (like food storage, clothing, and my attorney’s fees) before we filed the bankruptcy. It is possible to trick the trustee, and I am sure that I have had clients do it. But I would never sanction it, and if I discovered that they were committing fraud, I would not represent them. This entry was posted in Utah Bankruptcy on March 9, 2015 by robertspaynelaw. Can payroll stop a garnishment from a voluntary payroll deduction authorization form? Yes, or you could just tell your employer not to honor it. A “garnishment” is a court-ordered withdrawal from your paycheck. Court-ordered. 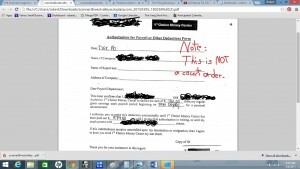 A payroll deduction authorization form is simply a voluntary form you sign and send to your employer. You could call your employer the next day to cancel it, and it’s cancelled. You don’t need bankruptcy for that. Unfortunately, some employers don’t understand this. 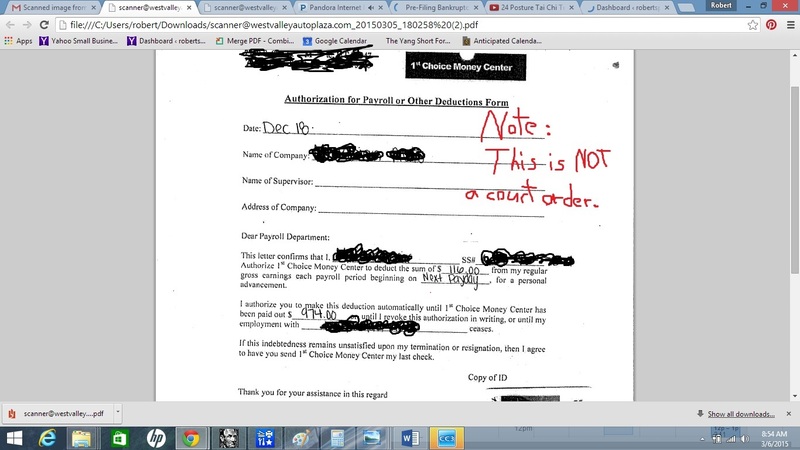 Pictured below is an authorization form for a payday lender to start “garnishing” my client’s wages. They don’t have a judgment. I tried to explain this to her payroll office, and they replied that unless they see a bankruptcy case number, they will process this “garnishment.” They’re wrong, but it’s her money, so we’re filing bankruptcy this weekend to stop it. This entry was posted in Utah Bankruptcy on March 6, 2015 by robertspaynelaw. Can I add any new bills I receive while my bankruptcy case is open? No, not unless they are new bills from old debts. I filed bankruptcy for a client two days ago. He contacted me today and was in the hospital. He wanted to know if this bankruptcy would cover his medical bills in the last two days. No. His bk was filed two days ago, and the medical services occurred AFTER he filed his case. It doesn’t matter that his case is open. It only covers debts from BEFORE he filed the bankruptcy. On the other hand, let’s say he had the medical problems two weeks ago and didn’t start getting the bills until months after we file. Those bills are covered, because the debt arose before the bk. Sure, the bills weren’t issued until after, but the actual medical procedures and the actual debt happened from an event from before the bk. This entry was posted in Utah Bankruptcy on March 5, 2015 by robertspaynelaw. 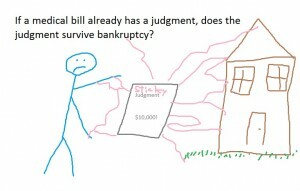 If a medical bill already has a judgment, does the judgment survive bankruptcy? No, except a little bit. Bankruptcy discharges your non-priority debts like medical bills. This means that they are wiped out. 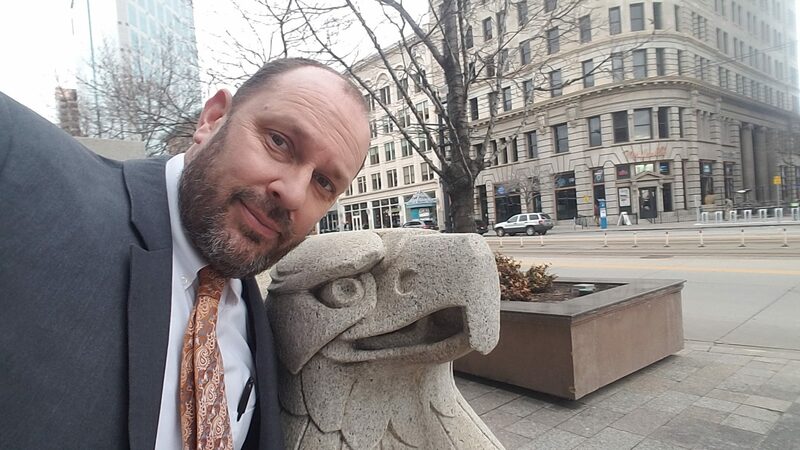 Additionally, it discharges any of those bills in collections, even if the Utah State Attorney General is the one suing you for those medical bills. 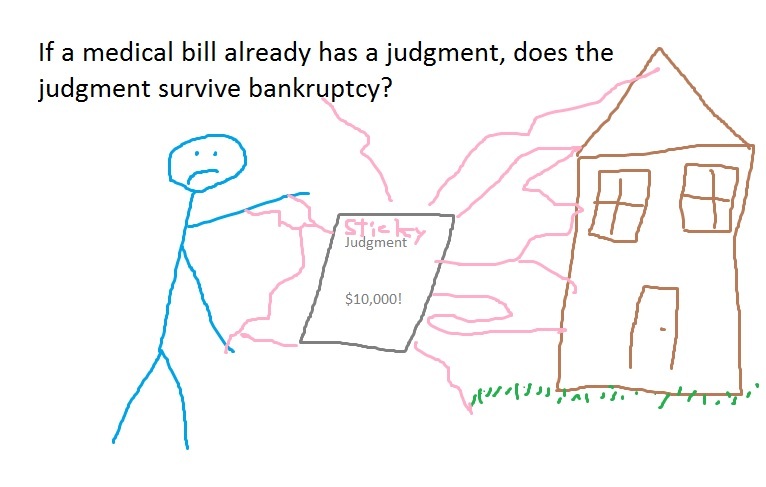 Bankruptcy even discharges your personal liability for any of those medical bills that eventually become judgments. So, you personal liability is wiped out. But those judgments survive to some extent. They will still appear on your credit for the next 7 years. If you had any real property (like a house or land), then those judgments are still attached to your real property. Bankruptcy may wipe out your personal liability on those debts and judgments, but the judgments remain. This does NOT mean that they can attach to new property you purchase after your bankruptcy. For example, if you go bankrupt with a $10,000 judgment, and then you buy a home a year later, that judgment will NOT be able to attach to your new property. It could only attach to anything you owned prior to your bankruptcy. This entry was posted in Utah Bankruptcy on March 4, 2015 by robertspaynelaw. What will bankruptcy do to my health? Will it make me lose weight, stop getting colds, and repair my marriage? Disclaimer: I’m not a doctor. I drink too much Mountain Dew and believe that food eaten in secret late at night tastes best (like Fritos and bean dip at 1 a.m. while watching re-runs of Stargate). However, I can honestly say that financial stress from losing your home, your job, your marriage, can kick your stress levels to epic heights. You gain weight. Your immune system suffers, and you start picking up little colds over and over. You can’t really go tell your neighbors that you’re stressed because you’re hiding the Suburban in the garage so that the repo man doesn’t pick it up tonight, so you end up taking out that stress on your wife. Financial stress is destructive to your health, your mind, and your relationships. So, when you file bankruptcy, everything changes. It’s like a 1,000 # weight is suddenly taken off your shoulders. Seriously. Your health starts to improve. You sleep better, and you stop getting those nagging colds. You eat better. You’re nicer to your spouse. Bankruptcy is not a cure-all, but it gets you back to zero. Sometimes a fresh start is enough to give you a fresh start on everything else too. 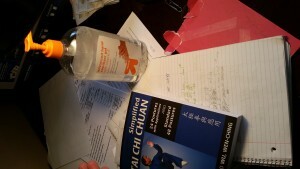 Pictured is my desk, with a mess of notes, papers, a jug of hand-sanitizer, and a Tai Chi book. I go through hand-sanitizer often because most of my clients have strange nagging little colds. I do Tai Chi in my office because I need to de-stress too. Don’t laugh: I could probably take you in a fight if you agree to move very, very slowly. This entry was posted in Utah Bankruptcy on March 3, 2015 by robertspaynelaw. 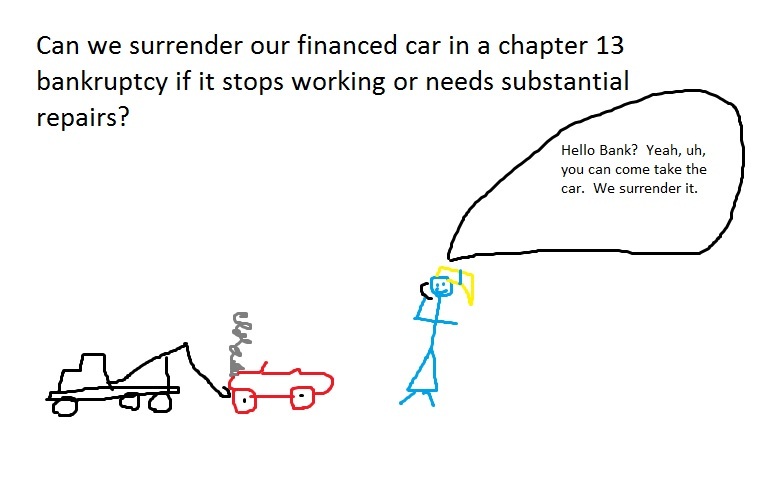 Can we surrender our financed car in a chapter 13 bankruptcy if it stops working or needs substantial repairs? In a chapter 13 bankruptcy, you can surrender your car and stop making payments on it, or you can keep it and keep making payments as part of your bankruptcy plan. However, it is a general rule of thumb that you cannot change the treatment of a secured creditor after your case is confirmed. So, let’s say you file bankruptcy today, plan on keeping your financed car, and then your plan gets confirmed (approved) by the court. You keep making payments on it, but after a year, it blows its engine. 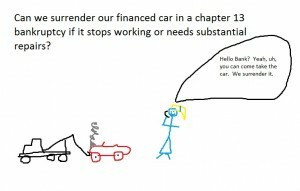 At this point, your plan is already confirmed, and you cannot just surrender the car and stop making those payments as part of your chapter 13 plan. You may be able to surrender the car back to the lender and hope that they amend their claim with the court after they sell it at auction, but this is not always the case. Just today I was covering a case for another firm where the client wanted to surrender his car back to the lender one year after his plan was confirmed. The lender objected, and the client is still making the same payments, for a car that no longer runs. So, in a chapter 13, if you want to keep a car loan, plan on keeping it to the bitter end. If you are worried about keeping it, then you should probably surrender it before your plan is confirmed and set in stone. This entry was posted in Utah Bankruptcy on March 2, 2015 by robertspaynelaw.